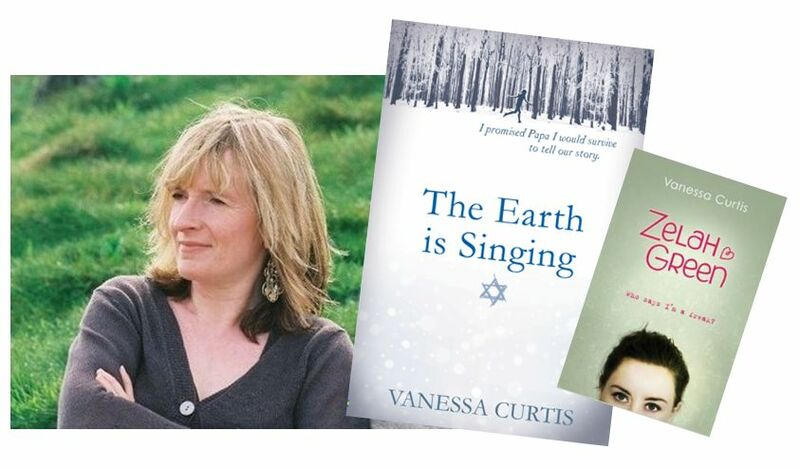 INTERVIEW: Vanessa Curtis ~ Children’s Author – You Can't Hide the Spark! You Can't Hide the Spark! I’ve been thinking… it’s about time I refreshed my blog and combined it with my author website. In preparation for the big move (I typed “bog move” just then, I hope it’s not a bad sign), I need to move a few things around. Over the next week, I’ll be posting five inspirational interviews I conducted in 2015. My mission back then was to interview people who had ‘found their spark’, i.e. those rare creatures who truly, madly, deeply LOVE what they do for a living. I interviewed two authors, a jazz musician, a creativity coach and a self-made millionaire. Vanessa originally trained as a pianist and says she never thought she’d end up writing books for children, “…but somehow Zelah Green was born and it’s been uphill all the way ever since!” Her first novel Zelah Green won the Manchester Children’s book prize in 2010 and was shortlisted for four other prestigious prizes, including the Branford Boase award for the most outstanding debut novel for children. Since then she has published four more novels and has been shortlisted for seven more awards. Her latest YA novel The Earth is Singing is her most personal work. It tells the story of Hanna Michelson, a fifteen-year-old Jewish girl who finds herself caught up in the horrors of Nazi invasion in 1941. You had a very personal reason for writing The Earth is Singing. Can you tell us about that? About three years ago, I found out from a chance remark made by my mother that her grandmother was born in Riga, Latvia, in the 1880s. She came over to the East End of London in about 1905, but I got to wondering what had happened to the rest of her family left behind in Latvia. So I began to research the history of the Jews of Riga, and what I found out was so shocking that I felt I had to tell their story, which still remains relatively unknown compared to that of other victims of the Holocaust. It’s an incredibly moving book, it must have taken a lot of research. How long does it take you to write research and write a novel? It depends – for historical novels I read and research for up to a year beforehand, but for contemporary novels I can bash out a draft in a matter of weeks. Weeks? You must be very disciplined! Do you set yourself a target number of words or a set period of time to write? I try to do 1000 words a day on my writing days, but often this turns out either to result in no words at all or more than 5,000 – it really depends whether I feel particularly inspired or not. Do you do much planning before you sit down to write your books? I plan in quite a lot of detail for historical YA novels, so that I know where all the key plot events and twists and turns will occur. This also enables me to see where pace and tension need to pick up. Aside from creating plot lines, what’s the most challenging thing about being a writer? Long, long periods of silence while you wait for agent or publisher to read and suggest rewrites, or waiting for the offer of a book deal. You get used to long waits, but sometimes it can be maddening! How old were you when you started writing books and how long was it before a publishing deal came along? Because I studied the piano and did quite well at that, it was expected that I would become a pianist. But I always wrote stories and poems at school. I started writing books when I was about 30, although I’d been publishing freelance journalism for about twelve years by then. I got my first publishing deal fairly quickly when I submitted proposals for a non-fiction book to six publishers. One of these signed me, and Virginia Woolf’s Women was the result of that. That must have been exciting – what did it feel like to be published for the first time? The first book I had published was actually more of a booklet, published by Bloomsbury Heritage (Cecil Woolf’s publishing company). When I opened the box of my author copies, it was probably the best feeling I’ve had to date in my career. So your first books were non-fiction… where did Zelah come from, and how did you come up with the name? I watched a documentary about eight years ago, about adults who live with Obsessive Compulsive Disorder, and I got to thinking how awful it must be for children who suffer from the illness. I had just taken the name ‘Zelah’ from a signpost on the way down to Cornwall, so I put the two together and ‘Zelah Green’ was born. The story is actually also a modern-day rewrite of ‘Snow White and the Seven Dwarfs’ – but most people won’t realise that, unless they already know what I was intending! Nowadays authors are expected to do the bulk of their own publicity. What’s your favourite and least favourite ways to promote your books? Promotion is a key part of every author’s life. I use twitter, Facebook and have a website. I particularly enjoy radio interviews, online blog interviews and signings. I’m not so good at standing in front of large audiences! I’m with you on that one. Any tips? For author events, remember that everybody in the room is pleased that you are there, and that they may be more nervous of meeting you than you are of meeting them! Speak slowly, and ask questions back to your audience to break the ice and get some discussion going. What’s the best way to generate book sales? Obviously the gold standard would be to get your book selected for a high-profile book club, or to win a major literary award. But other than that, you have to work your way up over a course of several years to try and get a name for yourself. If you could start your writing career again, what would you do differently? I might have focused more on training to be a journalist as I love writing articles and reviews, but I wouldn’t change my career as a children’s author because I do really love it, despite all the many ups and downs. Is being a writer all you thought it would be? Being a published author is a lot harder and you earn a lot less than I imagined. It’s important to have another two or three strings to your bow. I also teach the piano and do bits and pieces of freelance writing work, including literary consultancy, giving workshops, abridging novels etc. For first time novelists, do you think it’s important to have an agent? Do you have any tips for coping with criticism or bad reviews? Criticism from industry professionals is invaluable – take it on board, use it, learn from it to improve your work. Negative reviews and criticism should be ignored and never responded to! Without self-doubt I don’t think anybody would be a good writer, for it’s not possible to draw fully fleshed-out characters without some understanding of how we and they are all flawed in various ways. Good point, I hadn’t thought about it like that before. Finally, what’s your most important advice for aspiring writers? Read all the time, particularly in the genre you want to write in. Learn as much as you can and strive to keep improving your work. Being published doesn’t mean you can stop trying – in fact, it means the opposite, because you are only as good as your last book! Don’t be afraid to run your book past a reputable literary consultant before you send to an agent. They are there to help you get your book to the highest standard possible, and in today’s climate only a very few special books are ever signed up. And write from the heart about what interests you, not about things which you think might be the ‘next big thing’ – because by the time you got that book published three years later, the trend will have changed anyway! Thanks Phil, glad you enjoyed it. Nessie has since become a good friend of mine. She’s an amazing author. If you haven’t read The Earth is Singing, you should definitely look it up! © Katherine Bassford 2018. All rights reserved.